but first let us answer the bigger question at play… why strata management? With Australian strata properties valued at close to $1 trillion, it’s no surprise that franchising is a popular option for those wanting to run their own strata management business. Well over 2.2 million Australians live in strata properties and with more buildings going up each day, the demand for more service providers is growing at a rapid rate. The total value of strata management services provided by professionals and businesses nationwide is estimated at $900 million, so with millions of Australians investing their money in strata management, why wouldn’t you invest your future in joining this profession? You may have come across this article because you’re wondering whether the investment in franchising is worth it, or am I better off going out on my own? With so many different opportunities and alternatives available, it might be difficult to distinguish which is the best path to take. One of the primary motivators for buying a franchise is it allows you to go into a business for yourself, but not by yourself. Because you’re buying into an already established business, with proven growth potential and a strong support network. If you’re thinking about buying or starting a business, you will generally have to start from scratch or reinvent the wheel. Ace Body Corporate Management franchisees get a nationwide network of support and training from the beginning, equipping you with everything a strata management business needs to succeed. Franchising and business opportunities can sometimes seem fairly similar, but they do have a few distinct differences. Franchisees benefit from the franchisor’s continued involvement and presence in the business. The franchisor provides ongoing assistance and advice in a variety of areas, including: training, rights to business name and brand reputation/image, trading locations, occupation guidelines, business development and head office team members. A franchise is like a turnkey home, the business you buy into is there waiting for you to start and succeed. Buying a pre-existing business doesn’t come with any guidelines or support members. You may receive recommendations about the most effective way to operate the business, but these are only suggestions, not rules to steer you in the right direction. Sometimes, the history of the business is unknown, you’re going in blind hoping that it wasn’t poorly managed or had low staff morale. An under-performing business can require a lot of investment to make profitable. Top franchisees earn over $100k p.a. Having no direct experience in the strata industry, I chose to be part of the Ace Body Corporate Management franchise as it was a more secure business plan with its branding already established in the market. Benefits of being with a franchise is having access to a larger pool of resources and ongoing support to hold your hand through the journey. At Ace Body Corporate Management, buying a franchise means joining the largest franchised network in a $900 million professional services industry. 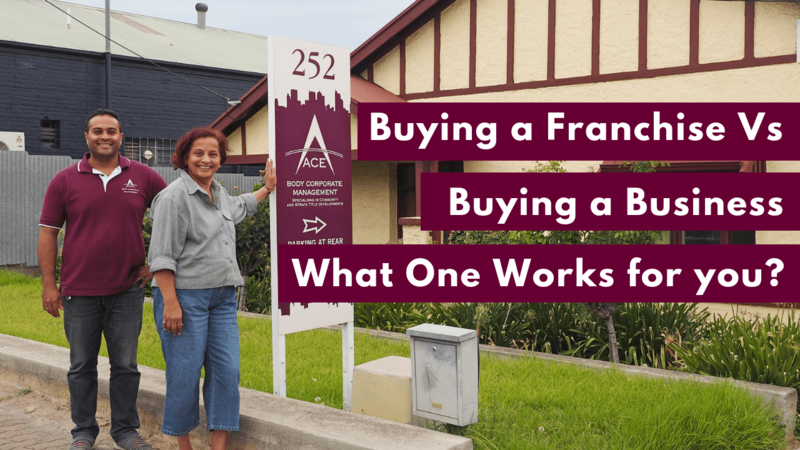 Ace’s franchising model, intensive training and recruitment of great franchisees has been the key to Ace becoming one of Australia’s largest strata title management firms. Ace is all about empowering their franchisees to be the very best they can be and helping to grow their business to their desired income level. Whether it’s working in an office or working from home, buying a franchise with Ace could be the best business decision you make. If buying a franchise is an option you’re considering, get in touch today and let us explain the opportunities ahead for you. With just a few simple steps, you could be one step closer to working from home or being your own boss, the choice is yours.